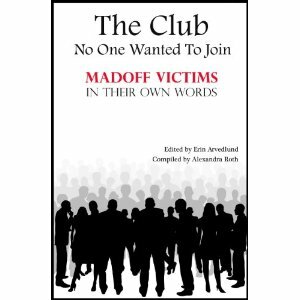 Before reading “The Club No One Wanted to Join: Madoff Victims in Their Own Words”, I erroneously believed that the majority of people who had lost big while investing with Bernard Madoff were the mega-rich. Sadly, most were hard working middle class Americans who lost their entire life savings. What happens to a person that has lost everything after working their entire lives to save for their families or retirement? Thanks for the review. Sounds like an interesting (but sad) book. As a Madoff victim, survivor and author of this book I want to thank you for your kind and understanding review. I hope that after reading this book people will have learned about the difficult ask of surviving financial and emotional catastrophes.